Looking for an experienced 3D artist? Contact me about your project. 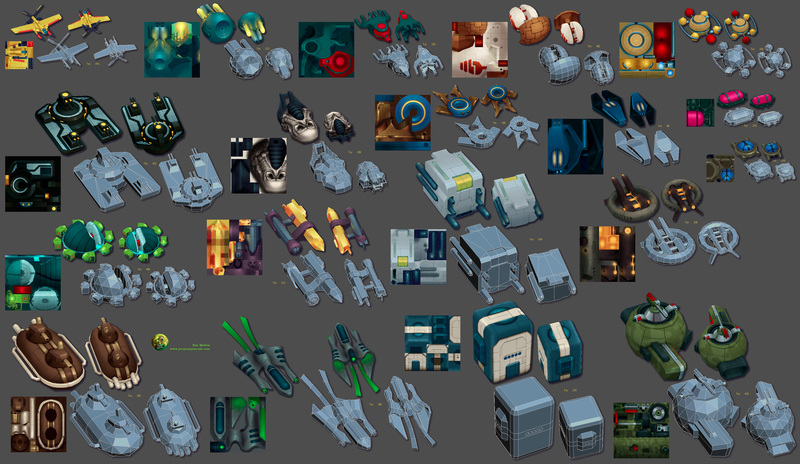 Go directly to my artwork to look at final images, in game screenshots, wireframes, and texture flats. Go directly to my catalog of tutorials. Created by myself over the years on various categories relating to 3D. 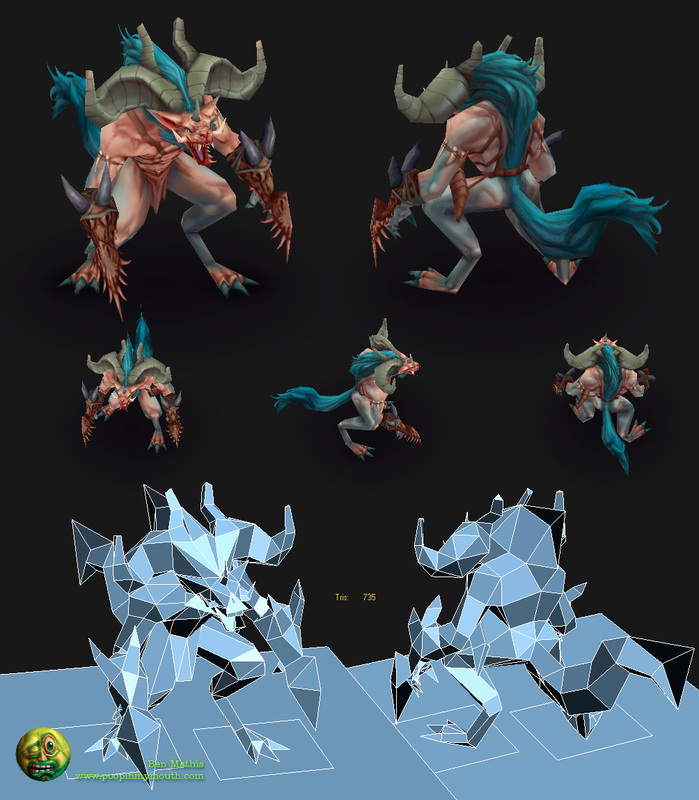 Looking for a 3D freelance artist? Contact me and tell me about your project. 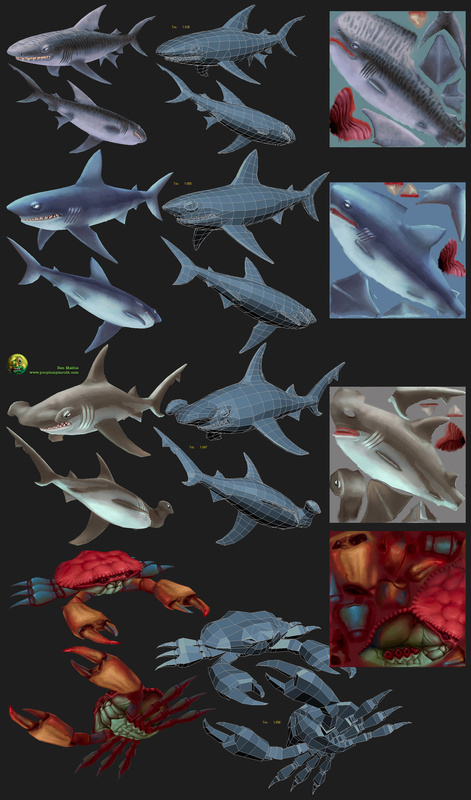 My name is Ben Mathis and I'm an experienced 3D freelance artist. I've been working in the game industry since 2003. 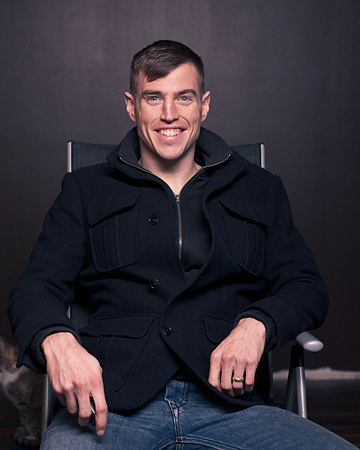 I've contributed to eleven shipped titles in the game industry, and one feature film as a modeler and lighting artist. I've also worked for several years in conjunction with different toy companies to make digital sculpts that have been turned into toys. I've worked for numerous studios both in-house and remote. 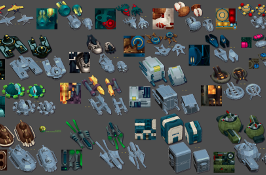 I specialize in creating characters, animals, weapons, and vehicles, for any generation of system, though I've also contributed to level design, lighting, and compositingI also create training material and pipeline enhancement. I enjoy coming up with new tools and processes, and then sharing them with the rest of my team. When possible, I also enjoy showing those results to the rest of the world, so that the video game industry as a whole can benefit and move forward with better art. Read my full resume here. My specialty is stylized art with strong forms and colors, high detailed hard surface mechanical models, and recognizable likenesses. 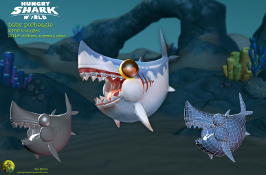 Having completed most of the playable sharks in the previous Hungry Sharks title, I was tasked with modeling and texturing the majority of player sharks for Hungry Sharks World. 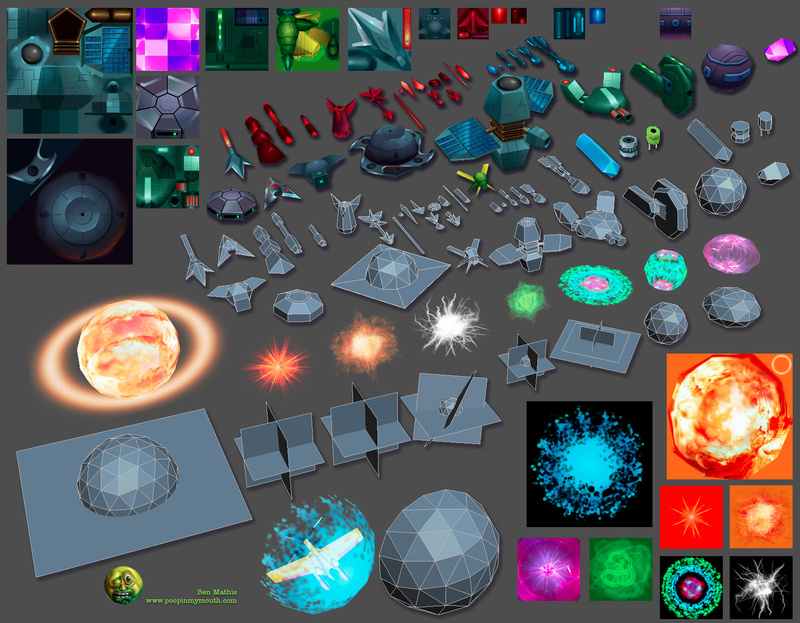 2D concepts were provided, and I delivered the assets as shown. 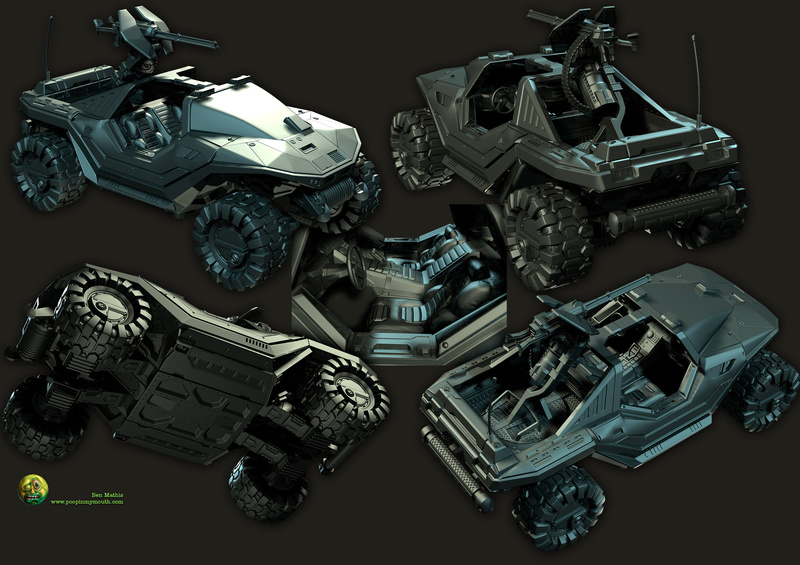 High resolution, water-tight meshes, sculpted for McFarlane Toys and used to produce the Halo Toy line. 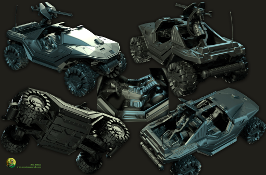 You can see the physical Warthog toy here. One further example, Mecha Spawn. Rotor is a product of Snjohus Games, a small studio consisting of myself and my husband. It is available on the Google play store here (with trailer). 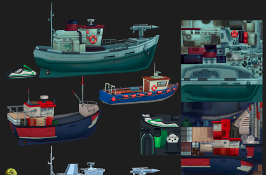 All ship designs by me. 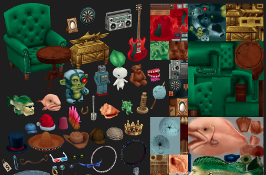 Most textures are 256x256, but a few are 128x128. All ships are 450 triangles or less. 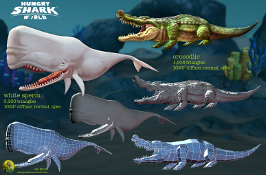 These were made for the first 3D version of Hungry Sharks by Future Games of London. 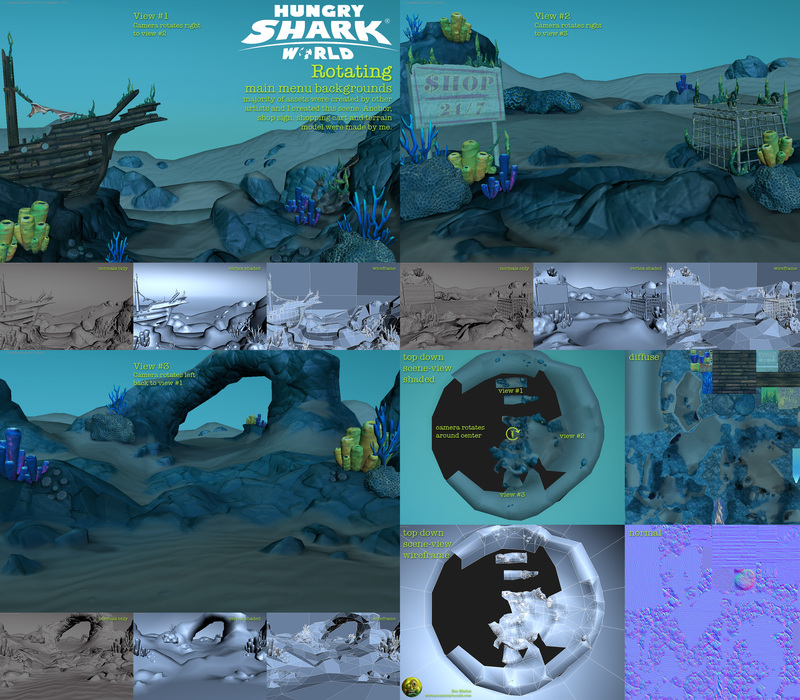 Textures from the shark come heavily from the original concepts, but all other assets were created from scratch by me. 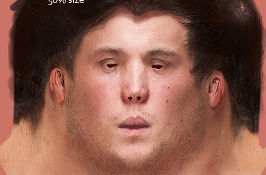 I was lacking some more realistic head models in my portfolio so set out to fill that gap. Based off a mid-20s Icelandic male. Textures are 95% photo reference. 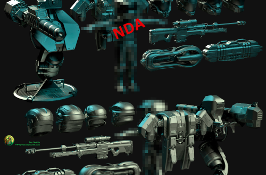 Normal map comes from a Sub-D surface and small details from crazybump. 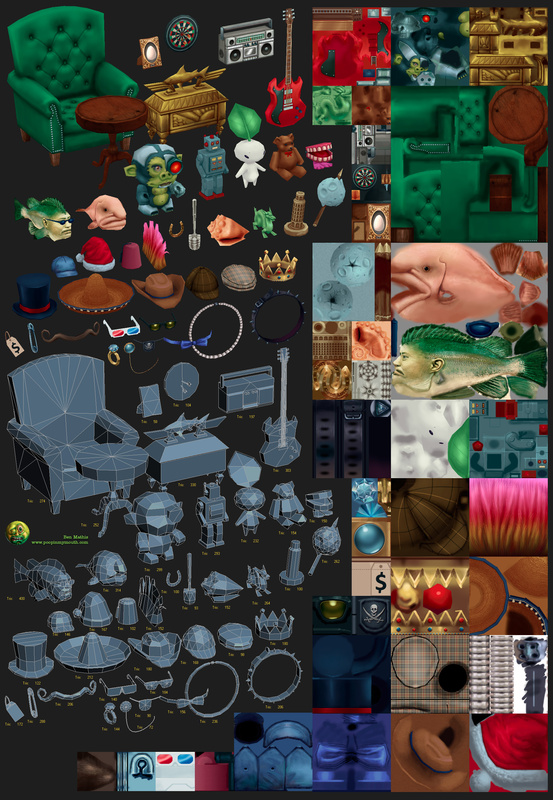 The studio provided a 2D concept from one angle, and gave me a texture limit and triangle count (735 triangles plus a 512x512 RGBA texture). I needed also keep track of total completion time which was 14 hours including rigging. I've neglected the site for the past couple of years so I thought it was time to re-design the page, modernize it and also provide fresh new tutorials and artwork. Look out for some more original work in the near future. Finally, like 2 years later, I edited and uploaded part 1 of my lecture at Carnegie Melon's Entertainment Technology Center. I cover a lot of the process of creating the bust to the right. Our game is out! Grab Rotor on Google Play. Trailer below. If you have benefited or enjoyed my tutorials over the years, I would really appreciate if you download the free version and rate it positively and give it a nice comment. Liking the Youtube trailer helps too. This was made by 4 people, myself for all 3D and UI, Ágúst, my husband for all programming, Peter Boehme for the intro illustrations, and Ian Dorsch for the music. 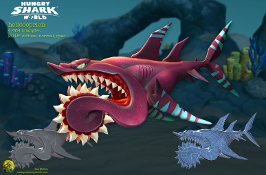 Head over to my 3D page to see the art from Rotor, as well as some new low poly art from Hungry Sharks Evolution. Some videos, some static text and images. From next-gen hair to hand painting strong forms and understanding light to advice on schooling and career. Videos are recordings of me working in real time, with audio commentary alongside. A quick video demonstrating 'double smoothing' using two turbosmooth modifiers on your subD control cage. A 10 hour texture painting session sped up to 50 minutes at 1080p. 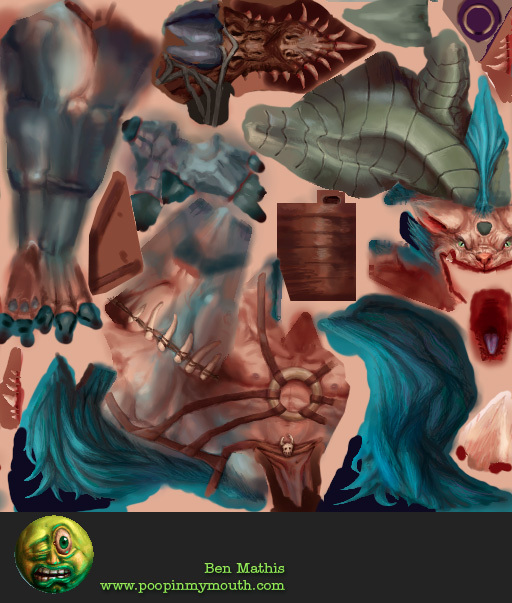 Mostly bodypaint. Shorter 5 minute low resolution version here. 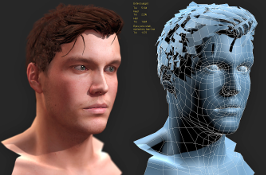 Using Ornatrix in 3DS Max to create low poly hair planes. Orthographic planes in 3D Studio Max. 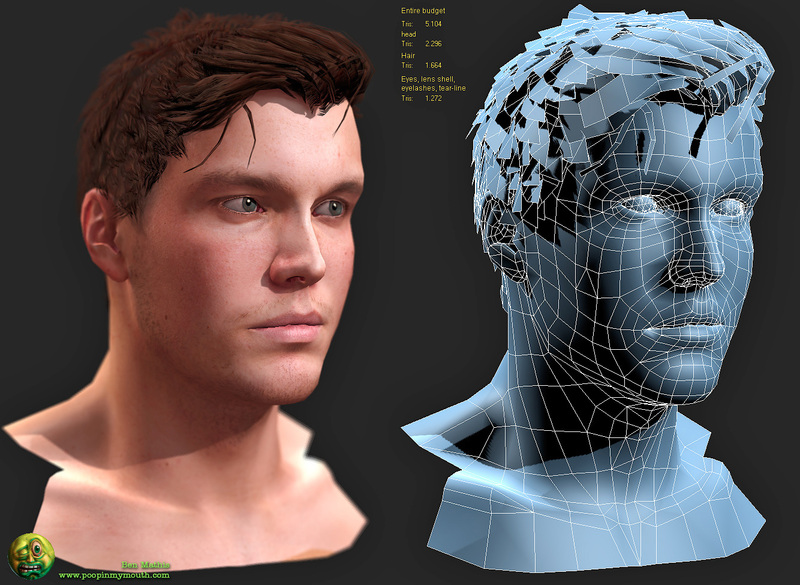 Head modeling in 3D Studio Max. 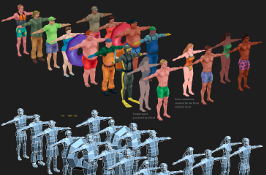 Body modeling in 3D Studio Max. 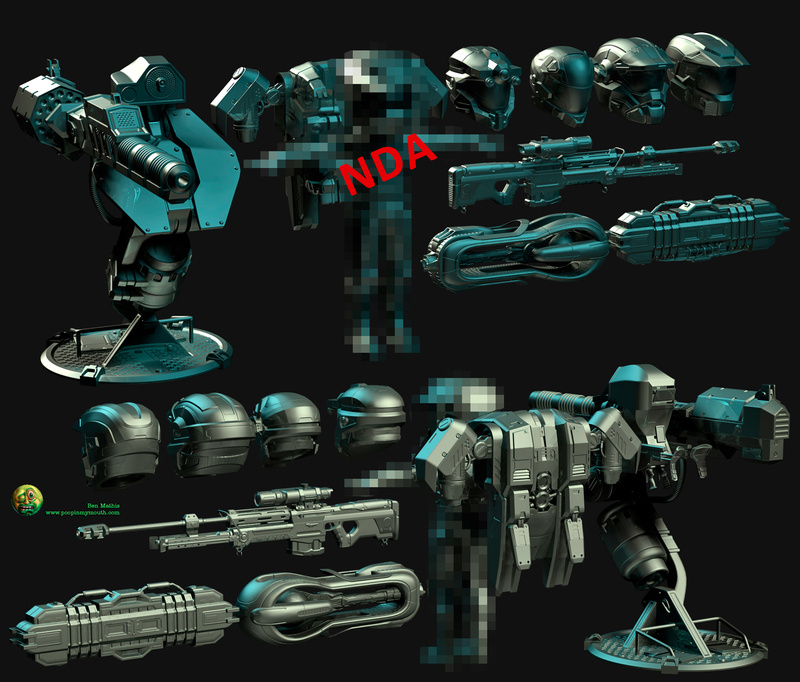 Gun modeling in 3D Studio Max. 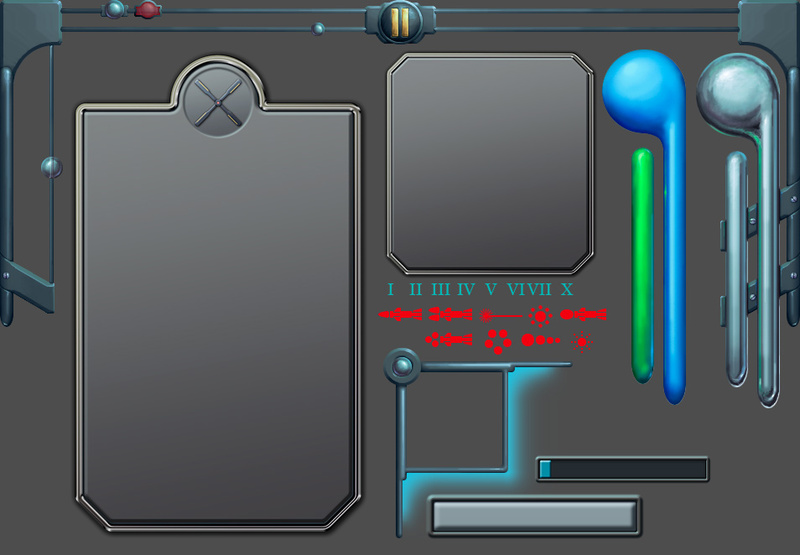 Gun UV layout in Unfold 3D Magic, and 3D Studio Max. Gun texture in Bodypaint, Photoshop, and 3D Studio Max. Face texture in Bodypaint, Photoshop, and 3D Studio Max. Hair texture in Bodypaint, Photoshop, and 3D Studio Max. 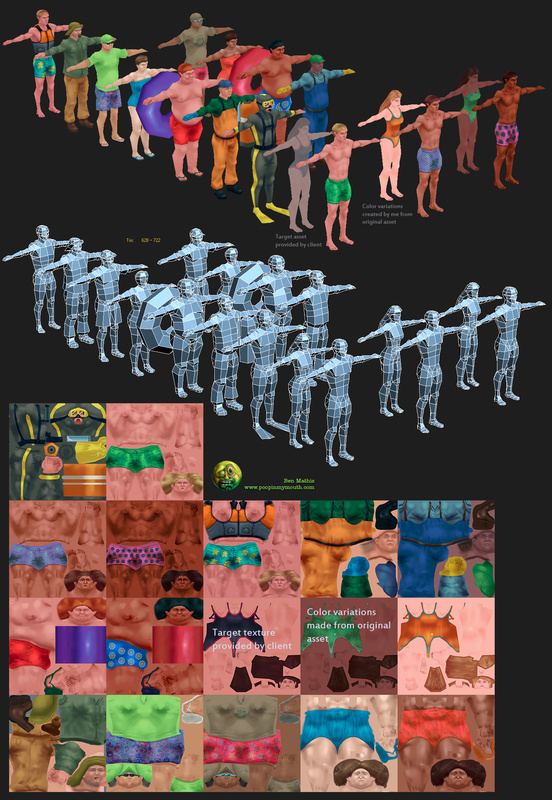 Body texture in Bodypaint, Photoshop, and 3D Studio Max. Timelapse of a 4,300 triangle model. Video of modeling only. Plays at fifteen times actual speed. Video of one of the ways I paint face textures. Short video on using Zbrush 2's tools in conjunction with 3D Studio Max render to texture feature. Massing out of the major forms. 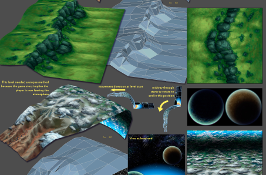 Laying out and arranging the UV map. 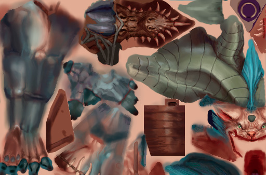 Photoshop techniques and introduction to painting textures. Using the Physique modifier on a mesh to rig it to a Biped. A short tutorial on all the basics. I assume you know nothing and walk you through. Static text and image based instructional material with pictures and text. Insights into your usage of time. Potentially offensive to the lazy and apathetic. Create "comb maps" to control anisotropy direction on a per pixel basis. 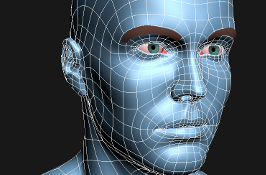 How to construct more realistic eyes using per-pixel shaders and transparent shells. 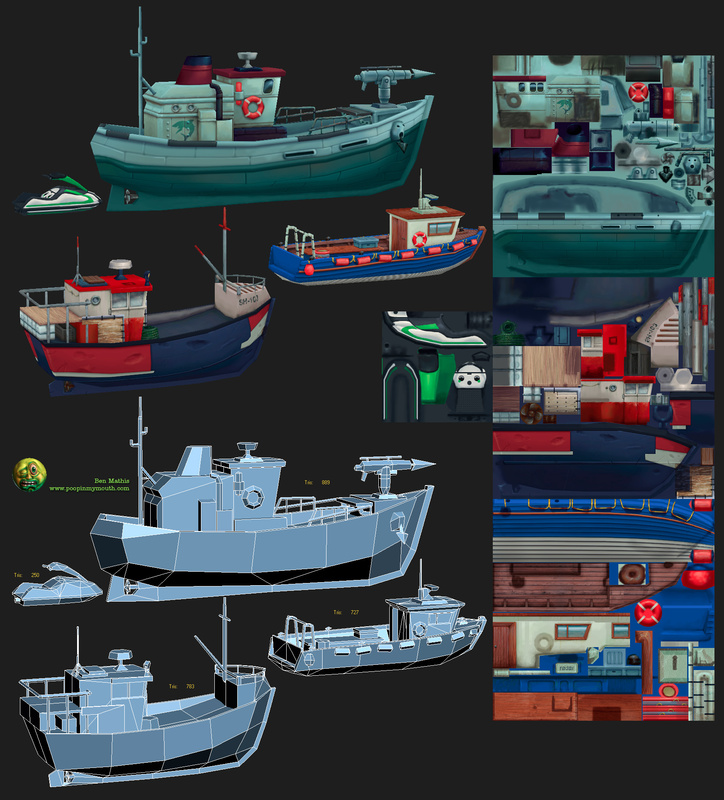 This tutorial covers my basic principle in creating textures for next gen assets. 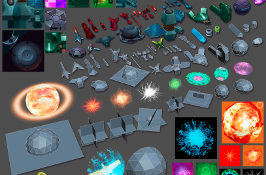 The 3D, 2D, and miscellaneous programs I use, as well as plugins and scripts. Links included. Should give an overview of my workflow. Page with assorted examples made for students and online forums. Explanation of the different settings in the Nvidia DDS plugin for Photoshop with example images. Guide to compression. Use multiple layers to augment baked normal maps with real depth in your overlays. Please don't hot link this image, my host complains. A short demonstration of painting ears. My personal advice for someone looking to receive formal art training. Tools I most commonly use in 3ds Max. This is the pdf that accompanies the fourth video tutorial for the Delilah series. 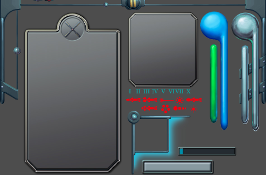 Tools I most commonly use in Photoshop. This is the pdf that accompanies the first two video tutorials for the Delilah series. 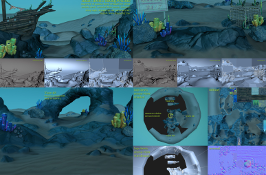 Covers all the things you need to know to start using normal maps in 3D Studio Max. My typical layer setup. This shows how I mask off each layer to allow greater freedom as I paint. 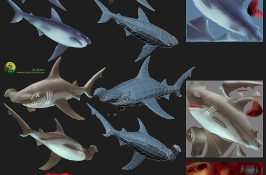 How to use smoothing groups in 3D Studio Max. Short tutorial on using Gradient Mask adjustment layers to colorize images. Short tutorial on using masks in your photoshop work. A paper on thought process. I try to explain my own while I practice. How I painted the hairs for Dark Age of Camelot: Catacombs expansion. Utilizing your texture space for environment work. Personal advice on using greyscale and colorizing after, versus painting once in true color. 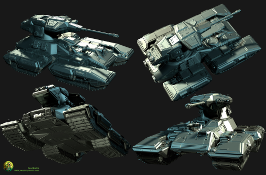 My opinion about painting double resolution then sizing down. Make sure to vary the hardness and softness of your edges when texturing. Quick and easy starting point for stubble and shaved heads. How I make eyes, both model and texture. Animation on how to arrange loops for good deformation. 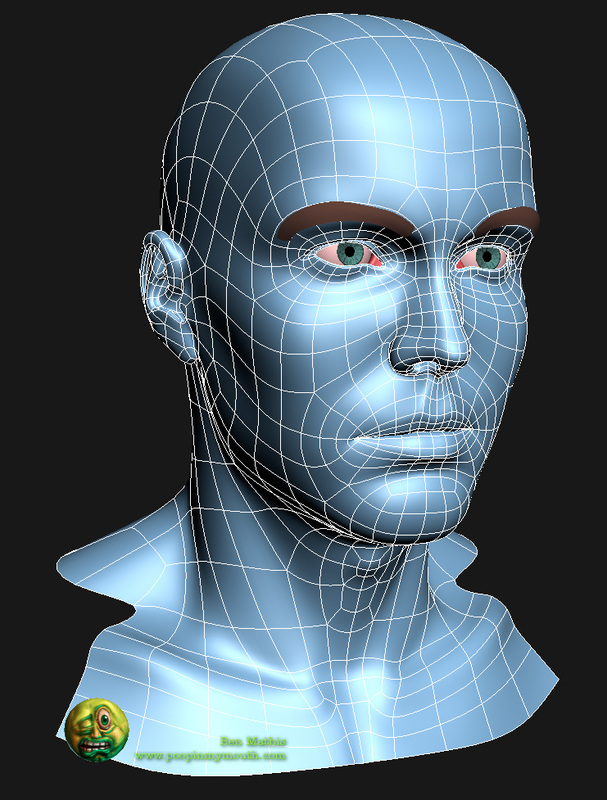 An example image of how I rig shoulders. 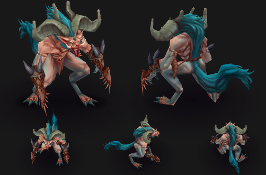 A complete walk through on how to create a fully modeled and textured character model. Old walkthrough of a horse model. Please send me a line if you have questions, need a freelance remote artist (though I am available for shorter on site work), or have feedback on my website. I answer all emails as promptly as I can. Check out my other projects: How we plan to retire early and our owner build house pole building project.